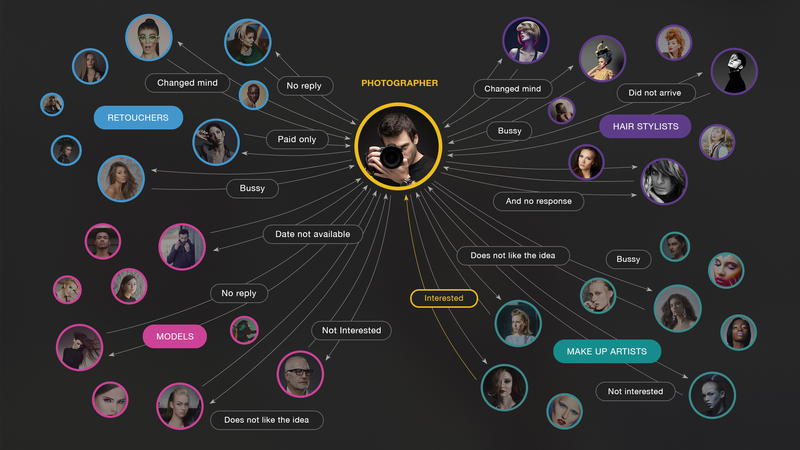 There is a chance that photography is your hobby, or you might be doing it professionally or have some connection as an art director, model, make-up artist or related in many other ways. In any case you have probably arranged a photoshoot involving other people at some point in your life. It starts simple. You need a model to put your idea to life, so you start asking your friends if they know somebody willing to pose in exchange for images. But if you want to find some specific look that implementation of your idea requires, it starts getting more complicated. It might be a friend of a friend of a friend that you would like to shoot for your next project, or some stranger that you have found on social network. And modelling agencies usually charge a nifty fee after all and there is a big chance you are on a tight budget. So you have found a model, she is eager to do this mutual project and asks if there is going to be a make-up artist that will assist. And again you ask all your friends if they know somebody and go through this tiresome process of asking, messaging and so on again. Ok, you have found a make-up artist you like that agreed to help you out for free, but… she is not available on the date when you and your model have agreed to shoot, and you start all over again. Finally, you have your team of three and after a week of preparations. You and your MUA are sitting and waiting on the model to join and TO DO ART. But she’s late… in fact half an hour later she calls you and tells that she is sorry and will not be able to come for whatever reasons. And trust me, sometimes they do not even call or pick up the phone. Weekend is wasted. ART IS NOT HAPPENING TODAY. Of course this is only one of many cases how things can turn out, maybe you pulled it off just perfect and with a bit of luck have made THE MASTERPIECE, that everybody else are talking about the whole next week on social media or it even went viral. Still this is just a simple example how many things can go south. And the more people are involved in your idea implementation the more potential risks you are running and more micromanagement it requires, more time consuming and frustrating it becomes. I am sure most of you know what I am talking about. It should look something like this on a bigger scale that is still relatively small. I have personally experienced all this on many occasions. And it there is a problem that needs to be solved. So I quit my job and moved to Bali for four months where I came up with a wireframe of the idea. 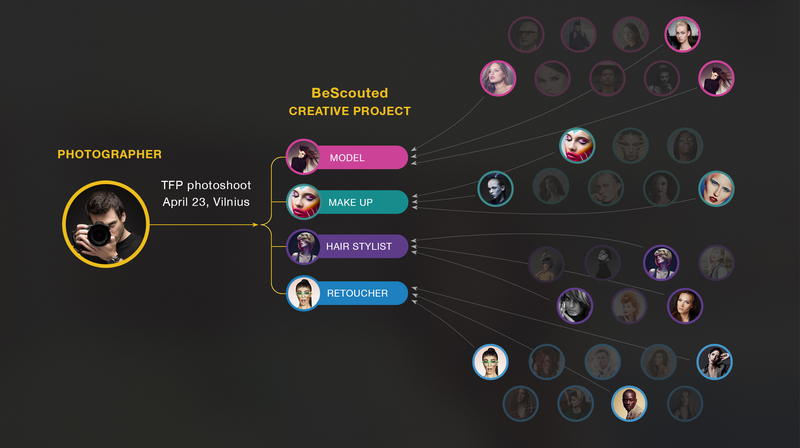 Returned back home, assembled the initial team, raised some money and started working on implementation of BeScouted. In three weeks from now we will present a tool that will empower freelance members of photography industry to find members for their projects, organize, implement and share their work back to the community in a reliable and time efficient way. You will be able to work on TFP basis as well as carry out commercial projects by utilizing the power of “Creative Projects”. Simplified scheme of it will look something like this eliminating all unnecessary steps to save your time and save you from irritating headaches that most of you have continuously been going through for a long time already. Anyone will be able to post a Creative Project be it an art director, photographer, model itself or a business that needs custom images and other BeScouted users will be able to browse and join the ones they like. You will have internal chat for each separate project to navigate among them conveniently, sophisticated rating system that will tell you about reliability of each applicant based on their performance in other projects, double profile types as photographers sometimes do retouching and models sometimes are really good at doing makeup or vice versa and many other things that will enhance your workflow, save your time and last but not least will allow you to make money doing what you love. It is roughly three weeks from now, and you will have opportunity to try out a tool that could shake the photography industry quite a bit. So please comment back after you try it. We value positive feedback, but negative feedback makes us move forward.